A few months ago Jim Langley, OVMRO team member (and co-founder of Climb it Range of course!) 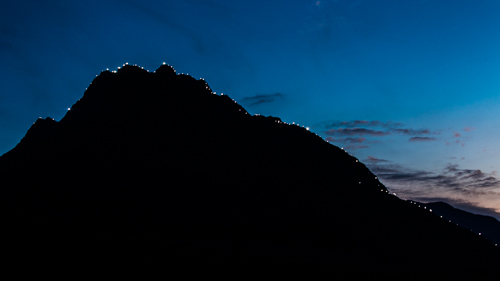 approached me with an idea: he had a vision to place people with head torches on the ridge of one of Britain’s most recognisable mountains Tryfan. He asked if I thought it was feasible and would I organise the photography. We picked an evening when the sun was setting behind the mountain. 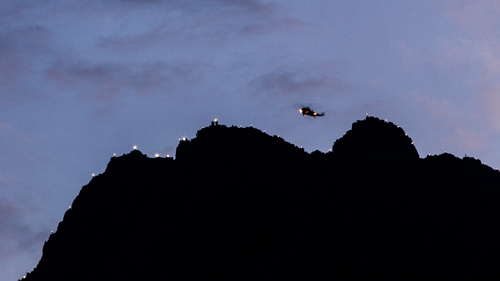 We wanted some ambient light to the right in the night sky, not directly over the ridge. We decided on Friday 17th April with a reserve date a week later. 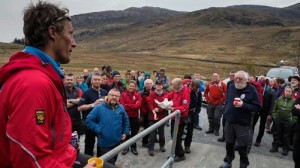 Jim contacted all current and past team members and the supporters of OVMRT. He had hoped to get 50 responses. The figure quickly reached over 100. Even the RAF search and rescue based at Valley in Anglesey wanted to be part of it. We organised the volunteers into nine teams. Each of these were given a place on the ridge and would be equipped with a radio and spare torches. Key placements along the ridge were also plotted. After organising a recce and dummy run, we altered the placement positions and refined our plans for the night. We even made arrangements for feeding everyone having asked a few friends to cook a stew for over 100 people. The week before the event we constantly checked the weather forecast. It looked good so we emailed everyone to arrive at OVMRO base a 5.30 pm. When we arrived it was overcast and cold with a promise of clearing skies around dusk. There was an intense excitement around as people began to arrive. Everyone was keen to make Jim’s vision happen and to be involved in something that would be very special. At the briefing Jim was quite emotional as it had taken months of organising and now it was about to happen. Reports began to filter in that they were experiencing a fantastic sunset to the west and all were in good spirits. Radio contact was made to the team leaders asking people to continue to point their head torches at us and we were blown away by the site that was in front of us. A frenzy of activity then took place as we captured what would be a once in a lifetime opportunity. As promised the rescue helicopter then came into view and sat just above ‘Adam and Eve’ the prominent feature of two upright plinths that mark the top of Tryfan. Reports came in that the light show could be seen for miles around and people were stopping their cars on the A5 and getting out to take pictures. As we returned to base, teams started to filter in. It was dark now and you could see streams of head torches making their way down the mountain. It was now a case of getting everyone down safely. Team after team came in with huge smiles on their faces. They knew that they had participated in something very special. John Rowell runs Soul of Snowdonia, with Nick Livesey and Marion Waine a photographic gallery based at Moel Siabod Café, Capel Curig, Betws-Y-Coed, LL24 0EL.